Well, I’ve been pretty terrible. With May and June being absolutely crazy at work and having to also try to fit in time working on my Master’s Thesis, I’ve neglected this blog far too much. I’m sorry. I have more free time now so I will try to get back into the groove. That begins today. With this free time I’ve decided to try my hand once more at home brewing. One of my favorite beers I’ve had was a Spruce IPA that was put out by Half Pints a couple of years back. It was tasty and I really loved the spruce. It also happens that Picaroon’s does a “Christmas tree IPA” which is very similar. So, I decided to try my hand at this. 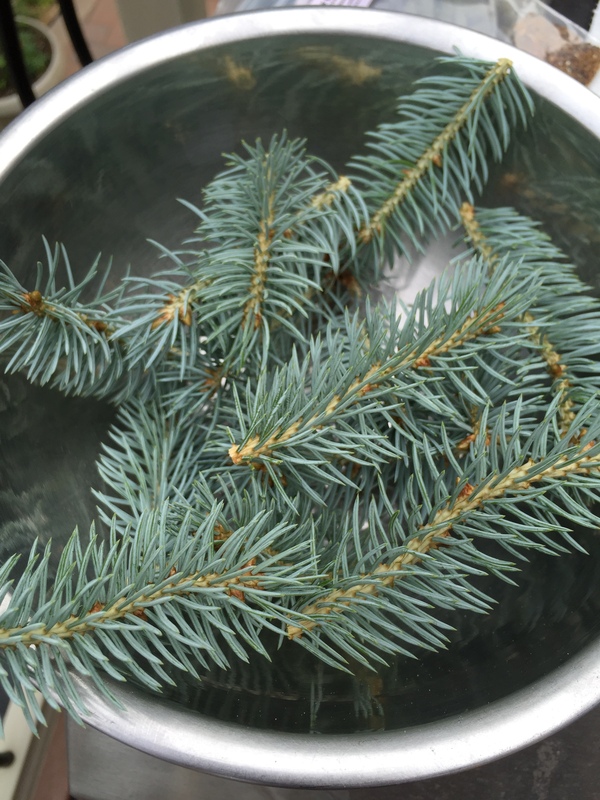 1 1/2 cups of fresh spruce tips – Added with bittering hops at beginning of boil. So far everything is coming along nicely. I’ve got it in the secondary to allow for some clarifying and aging as well as the dry-hop part of the process. I ended up with less than I expected. Using a new pale I must have mis-measured and have 20 litres instead of 23. Will see what impact that has. You learn from your mistakes and I’ve certainly made sure I will not do that again.